The permalinks of your individual pages also represent an important aspect of proper search engine optimization. That’s why BAVOKO SEO Tools also gives you the ability to make various settings to optimize your permalinks. Avoid too long URLs, error pages and duplicate content by setting up automatic redirects for your pages using our plugin. 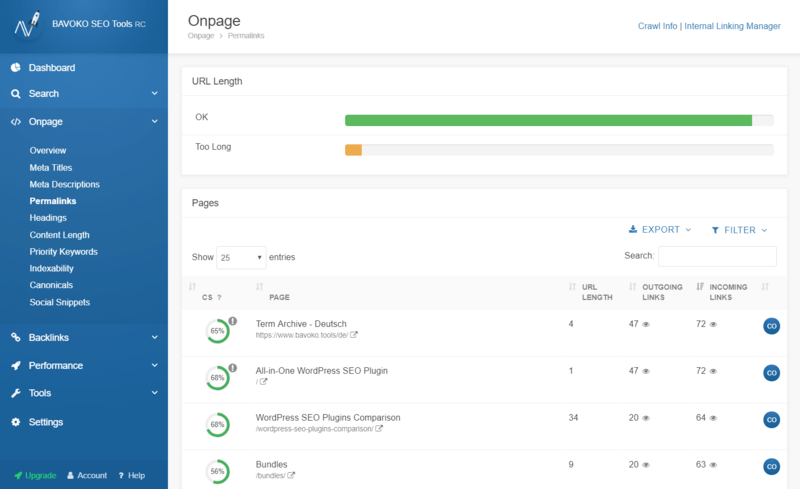 All settings can be found under “Onpage” > “Permalinks“. Use BAVOKO SEO Tools to set up automatic 301 redirects for all 404 pages in WordPress to overall prevent unwanted error pages on your site and to keep your link juice. Expand the “404 to 301 settings” line by clicking the arrow on the right. From the drop-down menu, choose your desired setting between “Home URL”, “Domain Home URL”, “Custom URL” or “Parent Directory”. Domain Home URL: A redirect to the domain of your website (domain.com). Home URL: Once you’ve installed WordPress in a directory or subdomain, redirecting to the home URL will take you to the subdomain or directory subdomain (subdomain.domain.com/directory). In all other cases the home URL is the same as the domain home URL. Custom URL: Enter an individual address for redirecting to a custom URL. Save your changes by clicking “Save” and check “Activate 404 to 301” to give BAVOKO SEO Tools permission to forward your error pages to the desired URL. Within the Permanlink settings of BAVOKO SEO Tools, you can also continue to shorten your posts by the category base, as well as to automatically forward the changed URLs. Check the “Hide Category Base” checkbox to automatically remove WordPress’s default “/ category /” section from your post URLs, thereby shortening your links. Once you set the checkmark, you will automatically be asked if you want to enable the “Auto Post Redirects”. Click “Yes” if you want your pages to be automatically redirected from old to new when you change their URL. 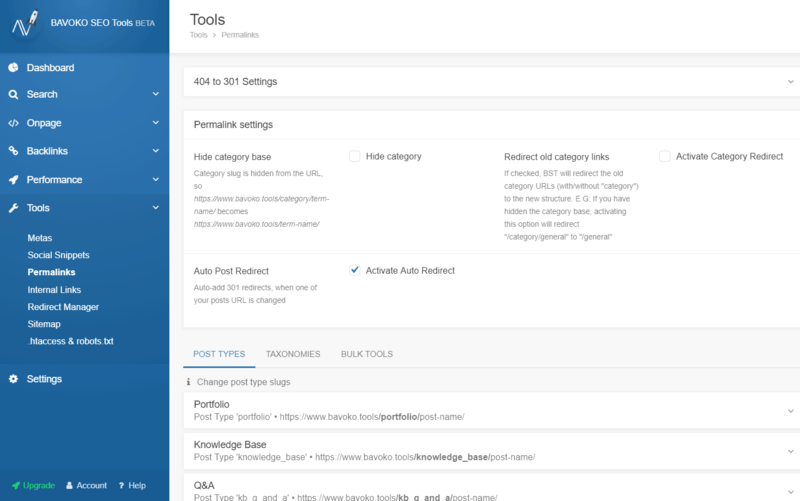 Further down in the Permalinks section, you can also set up individual post slugs for all post types or taxonomies. Navigate to the post type or taxonomy you want to edit and expand the section by clicking the arrow on the right. Now enter the part of the URL that should appear between domain and post name. BAVOKO SEO Tools saves your entries immediately. BAVOKO SEO Tools also contains a handy Bulk Tool for URL Slugs for quick, custom optimization of multiple permalinks in quick succession. The bulk tool for optimizing your permalinks can be found in the menu to the right of your taxonomies. This view includes a list of all your pages, each with a text box for the URL Slug, which you can filter by Post Types for a better overview. Enter the desired content in the respective text field. After you’re done BAVOKO SEO Tools automatically saves your changes and you can proceed directly to the next URL. 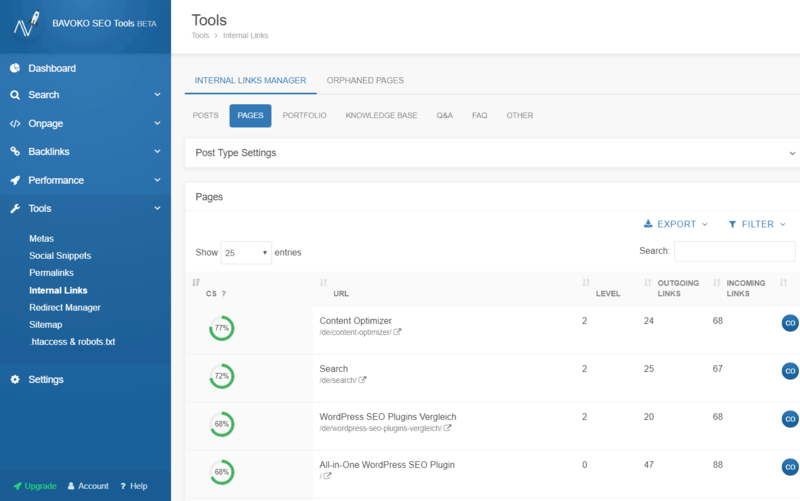 Also within the onpage analysis you will find a separate section for your permalinks. Helpful bar charts allow you to check the length of your URLs and to optimize them immediately if necessary. Navigate to “Onpage” > “Permalinks”. Here you can see all your URLs and find out at a glance, how many of them are too long. By clicking the “Too Long” bar, the table below will be filtered accordingly, so you can edit the too long permalinks directly with our Content Optimizer. 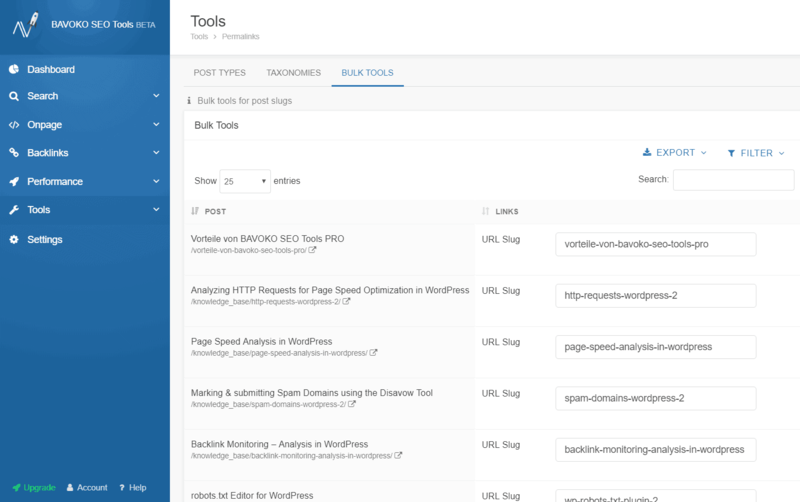 Thanks to the information provided by the external crawler, BAVOKO SEO Tools PRO also allows you to analyze all incoming and outgoing links of the respective pages and to thereby strengthen your internal link structure within “Tools” > “Internal Links” in the “Pages” tab with just a few clicks. Since the URLs and permalinks on your WordPress website are also an important ranking factor for the major search engines, you can use the various, practical SEO utilities in BAVOKO SEO Tools to make numerous adjustments and optimizations in a short time. Set up 404 to 301 redirects in WordPress in a few clicks, shorten your URL slugs or easily create permalinks for complete post types or taxonomies to further enhance your WordPress SEO.